warning: file_exists(): open_basedir restriction in effect. File(/var/www/domains/pjl-design.com/docs/sites/default/files/blog_images/needle2 detail.jpg) is not within the allowed path(s): (/usr/local/pem/) in /usr/local/pem/vhosts/166661/webspace/httpdocs/pjl-design.com/sites/all/modules/filefield/filefield_field.inc on line 310.
warning: file_exists(): open_basedir restriction in effect. File(/var/www/domains/pjl-design.com/docs/sites/default/files/blog_images/Needle1.jpg) is not within the allowed path(s): (/usr/local/pem/) in /usr/local/pem/vhosts/166661/webspace/httpdocs/pjl-design.com/sites/all/modules/filefield/filefield_field.inc on line 310.
warning: file_exists(): open_basedir restriction in effect. File(/var/www/domains/pjl-design.com/docs/sites/default/files/blog_images/Needle2.jpg) is not within the allowed path(s): (/usr/local/pem/) in /usr/local/pem/vhosts/166661/webspace/httpdocs/pjl-design.com/sites/all/modules/filefield/filefield_field.inc on line 310. After 3 days spent in the famous Choke studio, printing and printing and printing, I finally have a completed edition. I love the way the blues all turned out, and the addition of the brown tones have kept it from getting too cold. 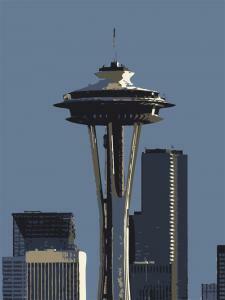 I am going to call this print "Blue Needle". I've been thinking that I need more evocative names than I've used in the past, and added to that is the great likelihood that I will do another portrait of the Space Needle before too long - after all, what's an image of Seattle without the Needle? Blue Needle was printed in 6 colors (3 blues, 2 browns and black), on a Cream colored Stonehenge cotton rag paper. I've found that using the cream colored paper also help to keep the blues from going to cold on me, yet since the cream is an underlying tone to the entire piece, the colors all hold together and the blues still read as blue. This was done in record time - 1 week from concept to completion. But a very long week it's been. Since I took the week of of work, I was able to focus a lot of time on this print. I believe all-told I've spend 30 hours working on this one. I spent about 8 hours working on the image today, and I have some really great textures on the top of the needle. It looks almost like it was painted with a pallet knife. So, I think I'm going to go with the vertical piece, since the image of the needle is almost twice as large, and really shows off the textures to a better advantage. I've been frustrated recently that people at the market walk past, and think that I'm selling photographs, not silk screen prints that are unique works of art. So, I think I need to abstract the images more than I have with the first 4 prints that I've made. I think this image of the Needle is definitely going in the right direction. I believe part of the problem is that my thinking is stuck on the notion that more resolution and definition is better - but that's what's leading to the images looking so photographic. I think I'll lower the resolution on this and see what kind of results I get. Now I start the long process of color separating, trapping, and creating the individual screens for this project. Hopefully I can start printing before the new year. So, since the CWB was out, I proceeded to go to Kerry Park at the top of Queen Anne Hill. The city looked fantastic! Of course you know the scene from here, the classic picture of Seattle with the Space Needle front and center. Well I took several from here, so there should be plenty to work with. From here I headed over to Alki, for another classic pose of Seattle. I think I'll do something different with this one and maybe do a composite image with the ferry boat from Ferry/Olympics. We'll see. Welcome to the future home of PJL Design. The website is currently under construction, and is expected to be launched by December 25, 2009. Please check back then. In the meantime, if you would like to contact Pete Lorimer, please email him.